A bursa is a pocket of connective tissue found adjacent to a joint. Bursitis is inflammation of a bursa, which results in pain, tenderness, stiffness and in some cases, swelling and redness. A bursa is a pocket of connective tissue found adjacent to a joint. Lined with a smooth inner surface, it facilitates the gliding movements of muscles and tendons over bony prominences. Bursitis is inflammation of a bursa, which results in pain, tenderness, stiffness and in some cases, swelling and redness. The inflammatory process can affect any bursa. Bursitis involving the shoulder, elbow, hip and knee are most common. Although the cause of this condition is unknown, repetitive direct pressure over a bursa can be a predisposing factor. In particular, certain activities or occupations are associated with a specific example because of the nature of the physical stress placed on the bursa. For example, housemaid's knee (kneeling) or student's elbow (leaning). Shoulder bursitis, the most common type, is characterized by an aching pain localized on the outside of the top of the shoulder. Pain intensifies when lifting or backwardly rotating the arm. Morning stiffness is typical. A person may have an isolated case of acute bursitis or repetitive cases of chronic bursitis. Taking anti-inflammatory medications is often a primary action for symptomatic relief. However, these medications have potential to cause stomach problems or allergic reactions. 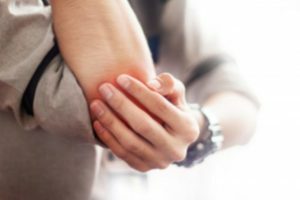 In cases of acute bursitis, a steroid injection may be effective in relieving pain, while in cases of chronic bursitis, pain is frequently more widespread. It is in these cases that acupuncture is often the preferred treatment for pain management. In addition, connective tissue may benefit from using herbs that strengthen it. The practitioner may attempt to identify broader contributing factors, such as general stress. Circulatory stimulants contribute to relief by increasing local blood circulation. Acupuncture, known to increase blood circulation, is quite effective in the treatment of bursitis. Acupuncture needles are placed in the precise location of pain and surrounding areas to increase blood flow. At our facility, we find combining the modalities of acupuncture, physical therapy, heat therapy and herbal treatment to be particularly effective in relieving pain associated with bursitis, tendinitis and many other injuries or conditions in which inflammation aggravates the situation.